Faith is resting in Jesus Christ, but it is also a battle. We war against our flesh when we exercise faith. From our flesh comes doubt, sin, fear, selfishness, pride, temptations, and hopelessness. These all will fight against faith. We war against the devil to exercise faith. From the devil comes fear, doubt, temptations, deception, trickery, and lies. Romans 7:23-25 But I see another law in my members, warring against the law of my mind, and bringing me into captivity to the law of sin which is in my members. O wretched man that I am! who shall deliver me from the body of this death? I thank God through Jesus Christ our Lord. So then with the mind I myself serve the law of God; but with the flesh the law of sin. Our flesh will give us plenty of trouble all on its own. Doubt - "Am I saved? How can God love me? How can I ever get the victory over this? Did God really mean what He said there?" And so much more. Sin - Lusts which war against the soul. 1 Peter 2:11 Dearly beloved, I beseech you as strangers and pilgrims, abstain from fleshly lusts, which war against the soul; Wicked behavior and attitudes. 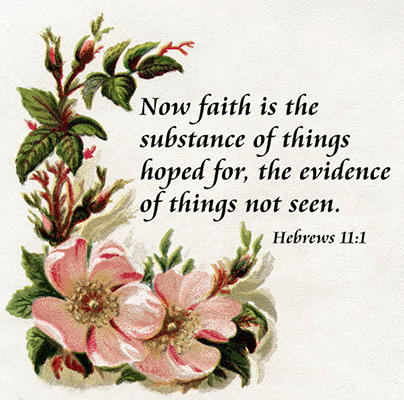 Defeat in sin makes it hard to walk by faith. Fear - There are many real and invented fears that can hinder us from living and walking in faith. Fear and faith also do not work well together. We need to choose to trust God. 2 Timothy 1:7 For God hath not given us the spirit of fear; but of power, and of love, and of a sound mind. Temptation - When we don't avoid or take the way of escape from temptation but allow ourselves willing to be led astray by our flesh it makes it very hard to fight the good fight of faith. James 1:14-15 But every man is tempted, when he is drawn away of his own lust, and enticed. Then when lust hath conceived, it bringeth forth sin: and sin, when it is finished, bringeth forth death. Pride - Walking in pride is contrary to faith because pride honors self and my abilities and accomplishments above God and trusting Him. 1 Peter 5:6-7 Humble yourselves therefore under the mighty hand of God, that he may exalt you in due time: Casting all your care upon him; for he careth for you. With humility we see casting our cares upon God, which is an act of faith. Hopelessness - When we fall into hopelessness, we stop living by faith. The two cannot work together. While it is not a loss of salvation, it is a loss of moving forward and acting by faith. 2 Thessalonians 2:16-17 Now our Lord Jesus Christ himself, and God, even our Father, which hath loved us, and hath given us everlasting consolation and good hope through grace, Comfort your hearts, and stablish you in every good word and work. 1 Peter 5:8-9 Be sober, be vigilant; because your adversary the devil, as a roaring lion, walketh about, seeking whom he may devour: Whom resist stedfast in the faith, knowing that the same afflictions are accomplished in your brethren that are in the world. The devil or his servants will also do their part to weaken our faith. Fear - The lion roars to instill terror in the animal so that it will run frantically in the direction of its own destruction. (Read more about this here.) He must be resisted steadfast in the faith, but we cannot do this if we are panicking at the sound of his roaring. Doubt - Suggestions, whether from people or from thoughts, that we are not really saved. Accusations that we cannot live the Christian life or that it is impossible for us to please God. Remember what he said to Jesus: Matthew 4:3 And when the tempter came to him, he said, If thou be the Son of God, command that these stones be made bread. He knew as well as Jesus did Himself that Jesus was the Son of God! Temptations - Of course there are temptations to sin. But, the main temptation is to question God and not believe His word. Satan will tell us that God lied to us. Out of this will come the idea that we can do things that we are clearly told are sin because we think that God didn't mean what He said. Remember the serpent with Eve in the Garden of Eden. Genesis 3:1 Now the serpent was more subtil than any beast of the field which the LORD God had made. And he said unto the woman, Yea, hath God said...? 4-5 And the serpent said unto the woman, Ye shall not surely die: For God doth know that in the day ye eat thereof, then your eyes shall be opened, and ye shall be as gods, knowing good and evil. He was blatantly calling God a liar. Deceptions and trickery - The adversary will send false friends, false teachers and teachings to tear us down and lead us astray. 1 John 4:1 Beloved, believe not every spirit, but try the spirits whether they are of God: because many false prophets are gone out into the world. Not only will they bring false teachings, they may also encourage us to doubt our own salvation or the truths of God's word. They may convince us that because we aren't a certain way that God can't do anything with us any more and we are a failure. Just one example of many - the idea that if you don't speak in tongues or show some other "manifestation," you can't be saved. 2 Corinthians 11:13-15 For such are false apostles, deceitful workers, transforming themselves into the apostles of Christ. And no marvel; for Satan himself is transformed into an angel of light. Therefore it is no great thing if his ministers also be transformed as the ministers of righteousness; whose end shall be according to their works. Lies - Along with the deceptions and tricks, of course, are the lies. John 8:44 Ye are of your father the devil, and the lusts of your father ye will do. He was a murderer from the beginning, and abode not in the truth, because there is no truth in him. When he speaketh a lie, he speaketh of his own: for he is a liar, and the father of it. How do we overcome these things? How do we fight the good fight of faith? When Christ was tempted in the wilderness by Satan He answered over and over with the word of God. (See Matthew 4.) Learn God's word. Read God's word. Remind yourself of God's promises and seek out friends who will remind you of His promises. Remind God of His promises when you're tempted to doubt. Speak the promises of God out loud in your home, in your car, wherever you can do so. The devils cannot read your thoughts, but they can hear you owning the promises of God out loud. Take time apart with God for prayer, rest, and refreshment. Jesus went alone to pray sometimes. Luke 6:12 And it came to pass in those days, that he went out into a mountain to pray, and continued all night in prayer to God. Matthew 14:23 And when he had sent the multitudes away, he went up into a mountain apart to pray: and when the evening was come, he was there alone. Deal with needs of the flesh that are real. The Lord Jesus also took his disciples apart from the crowds at times from what we can tell. Mark 6:31 And he said unto them, Come ye yourselves apart into a desert place, and rest a while: for there were many coming and going, and they had no leisure so much as to eat. Make an active effort to not let life swamp you till you cannot rest physically or spiritually. This takes intentional effort. As Jesus Christ did in Gethsemane, you may pour out your heart to the Father, even ask for reprieve if it be possible, but accept His will. Luke 22:41-44 And he was withdrawn from them about a stone's cast, and kneeled down, and prayed, Saying, Father, if thou be willing, remove this cup from me: nevertheless not my will, but thine, be done. And there appeared an angel unto him from heaven, strengthening him. And being in an agony he prayed more earnestly: and his sweat was as it were great drops of blood falling down to the ground. To sit down at his side. Original vintage images - Old Design Shop, and unknown.